This season, Robin Van-Persie and Chicharito are the favorite players of Emma in Manchester United. Emma told us that RVP is her favorite player because his magnificent goals and Chicharito because he always scores in last sec and make the whole team so happy. Who is the best player Manchester United had in its history? Emma: "Giggs! 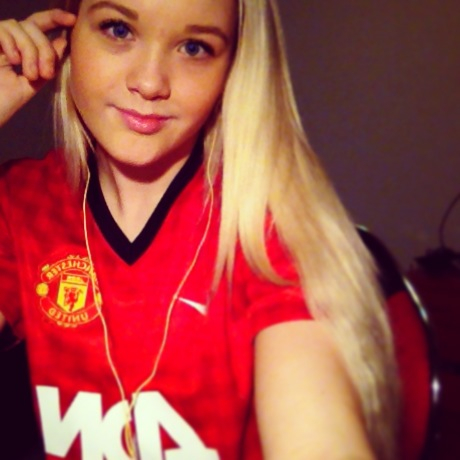 He is a legend, no doubt"
Emma hasn't been yet in games of Manchester United but she believes that she will visit Old Trafford in May 2013 (Emma, we want pictures from there). What is the best memorable moment you had with the club? Emma: "Rvps hattrick. I cried! I was so happy"
What Emma thinks about Alex Ferguson? She thinks that he is the best manager in the all world and he makes the team so special. Emma wishes that Christiano Ronaldo will return to Old-Trafford ("He belongs to United") and she believes that De Gea shouldn't play - "I like all the players, but I think that De Gea should be out and Lindegaard should be in. De Gea has'nt played so good this season, I think". What would be the achievements of the club this season? Emma: "Win Premier League beat Real Madrid, and win Champions League!" "I love everything in the club - All the players, managers and the fans. It's fabulous"